A Mexican strain of Talaromyces stollii LV186 was isolated from decaying pretreated corn stover. The production of cellulase and xylanase enzyme cocktails was evaluated with corn and sorghum stover used as inducers in a mineral medium. The volumetric and specific activities of T. stollii LV186 were compared with the values produced by Trichoderma reesei ATCC 26921 in a time-course experiment. After the submerged culture and a posterior ultrafiltration stage, the enzyme complexes were evaluated over acid-pretreated corn or sorghum stover in baffled flasks under controlled temperature and agitation conditions, and hydrolysis levels of 30 and 39 % of the theoretical maximum were obtained after only 72-h reactions, for each substrate. A side-by-side comparison showed a better ratio of endoglucanase to cellobiohydrolase to β-glucosidase and of xylanase to β-xylosidase enzymes in T. stollii than in T. reesei ATCC 26921. Furthermore, the hydrolysis of pretreated corn and sorghum stover achieved by T. stollii is significantly higher compared with that of a commercial cocktail from T. reesei ATCC 26921 (Celluclast). Therefore, the T. stollii LV186 strain is a good candidate for the hydrolysis of complex lignocellulose substrates. To the authors’ knowledge, this study is the first to describe the cellulolytic and hemicellulolytic activities produced by a T. stollii strain. The authors thank the Alcoholera del Centro S.A. de C.V. and The Mexican Council of Science and Technology (CONACyT) Technological Innovation, grants PETRAMIN 2010-138079, 2011-154298, and PETRAMIN/IDESA 2012-184417 and Secretaría de Energía (SENER)-CONACYT project 151029 to Centro de Investigaciones y de Estudios Avanzados del Instituto Politécnico Nacional. 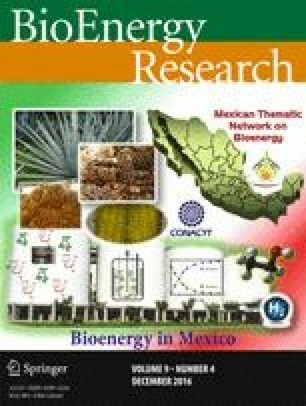 We thank Mario A. Caro-Bermudez (Biotechnology Institute, Universidad Nacional Autónoma de México), for providing us the pretreated materials and the Bioenergy Thematic Network (“Red Temática de Bioenergía”) grant 260457. Sluiter A, Hames B, Ruiz R, Scarlata C, Sluiter J, Templeton D, Crocker D (2008) Determination of structural carbohydrates and lignin in biomass. Technical Report. NREL/TP-510-42618. Available from: (http://www.nrel.gov/biomass/analytical_procedures.html). Sluiter A, Ruiz R, Scarlata C, Sluiter J, Templeton D (2008) Determination of extractives in biomass. Technical report. NREL/TP-510-42619. Available from: (http://www.nrel.gov/biomass/analytical_procedures.html). Sluiter A, Hames B, Ruiz R, Scarlata C, Sluiter J, Templeton D (2008) Determination of ash in biomass. Technical Report NREL/TP-510-42622. Available from (http://www.nrel.gov/biomass/analytical_procedures.html).